So there we have it. 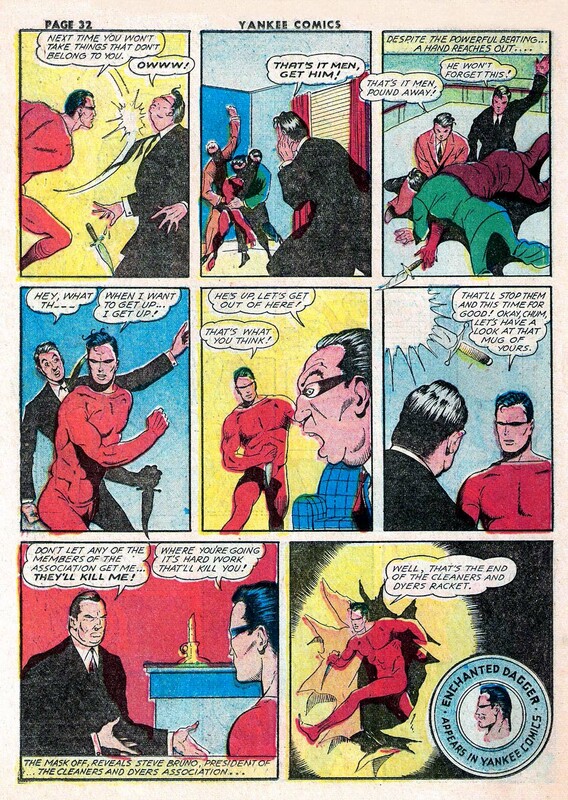 The last page of the fourth of the four original Enchanted Dagger Comics, drawn by George Tuska for Harry A Chesler’s Yankee Comics #4 in 1941. After reading this 7 page comic, and a brief bio of the character on-line, I was inexplicably set on resurrecting the character for a nine issue 200+ page comic book series, a commitment of many years worth of creative energy for a novice comic creator who probably should have thought better of it. Was it the weirdness, the wrongness, the Cleaners and Dyers Association that hit the right note for me? As I’ve noted in these comments over the duration, there were a lot of factors that came together in one perfect storm of wrongheadedness (sigh). Having never made anything longer than 36 pages prior, Edag continues to be a big challenge, but as a project to cut my teeth on, I continue to find it pretty amusing. Speaking of amusing…Roger Chalmers isn’t the only character from Yankee Comics to make an appearance in our comic opus. Yankee Boy himself, Phil (I forget his last name) who appeared in Issue #2 (and also in Issue #4’s line up of Great City’s most Glamorous, where I misidentify him as “Victor”) of our comic rendering was was one of YC’s signature heroes. Phil will show up again in Issue #6. Also worth mentioning from Yankee Comics is a character name Johnny Rebel, one of many examples of racist caricature that showed up in the early comic books. Young blond haired Johnny dons a mask and a costume of Rebel grey and is assisted by a subservient black man who bears an immediate resemblance to the “Stephen” character played by Samuel L. Jackson in Django Unchained, but who speaks in a notably offensive black dialect undoubtedly derived from the blackface minstrel tradition. We’ve tackled that subject before, if you’ll recall, in Issue #3, when the Golliwogs showed up. Blackface has showed up in the news recently, too (Virgina Governor, Attorney General). Unlike in our humble attempts at making comics which tries to reflect the racial ambiguities of our culture (and carefully references black literature for examples of black dialect), these old time comics presented the mainstream racial views of their age… views which hopefully won’t become mainstream again. Next week I’ll begin posting Tales of the Irreal #1, my first effort using Golden Age characters. Like the earlier Moon Man, the art work is very raw, as I was still tinkering with Adobe Illustrator. Unlike Moon Man, I will be giving it a round of touch ups before I post. It, uh, really needs it in a few places…but it’s a fun one! More on it next week.